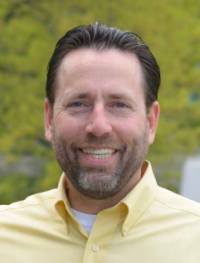 While Alaska’s Joe Miller came up short for a third time in his bid for a seat in the U.S. Senate in 2016, he nonetheless turned in a history-making performance. As a Republican, Miller had previously lost by four points in the general election to Senator Lisa Murkowski during her 2010 write-in campaign and then fell 7.9 points short seeking the GOP nomination won by Daniel Sullivan in 2014. The Tea Party favorite was an 11th hour recruit by the Libertarian Party in September 2016 and his brief, two-month campaign won him an impressive 29.4 percent of the vote in the general election – 14.9 points behind Senator Murkowski. Miller not only far exceeded his polling numbers (which usually had him in the mid- to high teens), but he demolished his party’s mark for its all-time best showing in a race for the office. Smart Politics examined the more than 330 Libertarian U.S. Senate candidates to appear on the general election ballot since 1976 and found that Joe Miller’s 29.4 percent showing in Alaska this cycle crushed the party’s previous best performance by nearly 11 points. Going into the 2016 cycle, the most support ever received by a Libertarian U.S. Senate nominee was the 18.4 percent claimed by Michael Cloud in Massachusetts 2002 election won by John Kerry. However, Kerry and Cloud did not face a Republican opponent in that race. Miller, however, faced a full slate of candidates. In addition to Murkowski, Miller was opposed by a Democratic nominee (Ray Metcalf, 11.1 percent) as well as an independent candidate who had the support of some prominent Alaska Democrats (Margaret Stock, 13.7 percent). Two other independents were also on the ballot (Breck Craig and Ted Gianoutsos). The previous high water mark for a Libertarian U.S. Senate candidate in an election in which both major parties fielded a nominee was set by Carla Howell of Massachusetts in 2000. In that race, Howell won 11.9 percent – nearly beating Republican Jack Robinson (12.9 percent) as Ted Kennedy cruised to an 8th term. Miller crushed Howell’s record by 17.5 points. 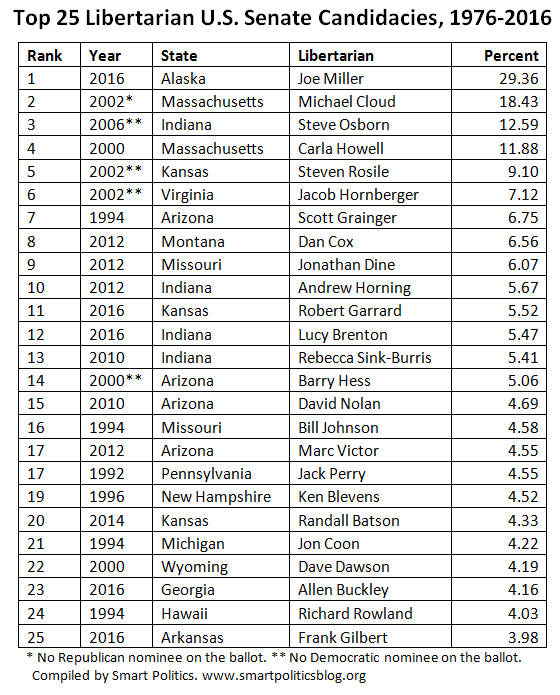 The remaining Top 10 Libertarian U.S. Senate performances over the decades were turned in by Arizona’s Scott Grainger in 1994 (6.8 percent), Montana’s Dan Cox in 2012 (6.6 percent), Missouri’s Jonathan Dine in 2012 (6.1 percent), and Indiana’s Andrew Horning in 2012 (5.7 percent). Prior to 2016, the average Libertarian U.S. Senate nominee had won 1.7 percent of the general election vote. In 2016, the party’s 20 nominees averaged more than double that amount at 4.3 percent (and 3.0 percent even without including Miller’s hefty tally). Libertarians saw 11 of its 20 candidates in 2016 reach three percent – besting the previous record of six candidates set last cycle in 2014. Including Miller, Libertarian U.S. Senate nominees set state party records in nine states across the Midwestern, Southern, and Western regions of the country. Arkansas, Frank Gilbert (3.98 percent): Gilbert nearly doubled the 2.03 percent won by Nathan LaFrance in 2014. Gilbert and LaFrance are the only two U.S. Senate candidates to get on the general election ballot in the state under the Libertarian Party banner. Colorado, Lily Williams (3.61 percent): Williams, the seventh U.S. Senate nominee for the party in state history, eclipsed Gaylon Kent’s 2.59 percent record from 2014 by just over a point. Florida, Paul Stanton (2.12 percent): Stanton more than quadrupled the support received by the party’s only other nominee for the office in state history – Alexander Snitker in 2010 (0.46 percent). Georgia, Allen Buckley, 4.16 percent): Buckley broke a 20-year record held by 1996 nominee Jack Cashin (3.60 percent). Libertarians have fielded U.S. Senate nominees in 10 elections in the Peach State since its first nominee in 1992. Iowa, Chuck Aldrich (2.71 percent): Aldrich, the seventh nominee fielded by the party for the office, broke 2010 nominee John Heiderscheit’s record (2.27 percent). Aldrich also owns the second best performance in neighboring Minnesota (0.48 percent in 2008). North Dakota, Robert Marquette (3.08 percent): Marquette almost doubled the party’s previous best showing in the state in a U.S. Senate race – Keith Hanson’s 1.63 percent in 2010. Oklahoma, Robert Murphy (3.00 percent): Murphy – the first nominee to gain ballot access under the Libertarian banner in 20 years for the office – crushed the party’s previous best mark of 1.23 percent set in 1996 by Agnes Reiger. Wisconsin, Phil Anderson (2.96 percent): Anderson bested Joseph Kexel’s 2012 campaign (2.07 percent) by nearly a full point. None of the other seven U.S. Senate Libertarian nominees in the Badger State over the decades had reached one percent. An additional six other 2016 nominees turned in the second best Libertarian U.S. Senate performance in their respective states: Robert Garrard in Kansas (5.52 percent), Edward Clifford in Pennsylvania (3.84 percent), Sean Haugh in North Carolina (3.56 percent, 0.18 points shy of his own record), Kent McMillan in Illinois (3.22 percent), Richard Lion in Connecticut (1.14 percent), and Alex Merced in New York (0.65 percent). Overall, the 2016 cycle saw Libertarians claim five of the Top 25 slots among the more than 330 nominees to appear on the general election ballot in party history: Miller in Alaska at #1, Garrard in Kansas at #11, Brenton in Indiana at #12, Buckley in Georgia at #23, and Gilbert in Arkansas at #25. Libertarian U.S. Senate candidates outperformed their party’s presidential nominee, Gary Johnson, in seven states: Alaska, Arkansas, Kansas, Indiana, Georgia, North Carolina, and Pennsylvania. 4 Comments on "Joe Miller Shatters Libertarian US Senate Record While 8 Others Set New State Party Marks"
Thank you for paying attention. This is why I help nominate and vote for Libertarians: I believe voters must lead the politicians, not follow them. Trends are the parades political candidates and incumbents run to get in front of; voters have to point the way. He would’ve done better among libertarian voters if he actually spoke and endorsed libertarian values. Joe Miller openly stated he did not support the national party, the national candidate, basic libertarian values and almost daily misrepresented libertarianism. He was a Republican running with an “L” and nothing more. Daniel is incorrect. He has an ax to grind that skews his perception. While it is true that many Libertarians including Miller did not support the Johnson/Weld ticket.He also did state that the that he had issues with certain planks the national platform but no Libertarian is lock step with every word of the platform including Johnson/Weld. In every debate and public appearance Miller represented Libertarian values well. Joe Miller is no Libertarian and a typical lawyer, he got fired from his job and wants revenge. I am a lifetime Libertarian and registered Libertarian voter who lives in Anchorage, Alaska. I voted for the independent because Joe is actually a Republican. He replaced Cean Stevens because he had more name recognition. Cean should have never stepped down to let Joe Miller run. Cean actually understands the economy and a really honest person. Its sad that the loudest or richest people get the most attention instead of the best person for the job.